We also service all of the Phoenix, Arizona! Yes, that's right. 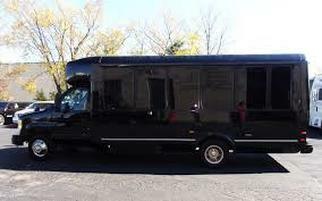 We have upgraded our fleet and now offer party bus rentals in Phoenix as well. With over a million people living just in Phoenix proper, it is important we offer our night life rides there too! You will most common see us in Arcadia or the Biltmore area picking up and dropping off customers in local bars, night clubs, Sky Harbor Air Port and gentlemen's clubs. The capital city now represents more than half of limousine bus rentals. When a convention is in our downtown, you often see one of our limo rentals. Call us today! Do you need a party bus from Phoenix to Las Vegas? We can help! We have driven many bachelor parties and company work trips from our central location in Arizona to Sin City! Those are some of our most memorable trips! Jason Pheiler from the PHX says, "I've lived all over the west coast for the past 10 years and have rented many party buses and limos throughout that time. I have to say, I was a bit surprised when I searched "Party Bus Rentals Phoenix" and this company from Old Town Scottsdale came up at the top of the page. When I called them, my first question was if they serve Phx too? They said of course and then I continued to book my limo. It was the best bus rental I've had in the past few years. Driver was very professional and made the whole celebration worth it"
You are probably on this page because you searched online "Party Bus rental Phoenix AZ". Our capital city location is centrally located near Sky Harbor International Airport and also close to the Arcadia and Biltmore area. We often take our limo rental customers to downtown Phoenix to popular restaurants and hot spots including Valley Bar and Durant's both on Central Ave. So if you need our services in Phoenix, then don't hesitate to call our team. We pride ourselves on answering the phone and providing the best party bus rentals in AZ and all of Maricopa County! Maybe you and your friends are on a close budget and need a cheap party bus rental in Phoenix? You can call us to see what a party bus rental costs, we are very honest about our pricing and try to get you the best deal in the whole state of Arizona. Our dispatch can go over all of your needs and how long you will need our rental services. Then they will give you a quote that won't change. We pride ourselves on being the best party bus in Phoenix!